Buy 1 Get 1 Promotion: From 1 Mar-30 Apr 2019, buy 1 ticket to the show and get another one free! 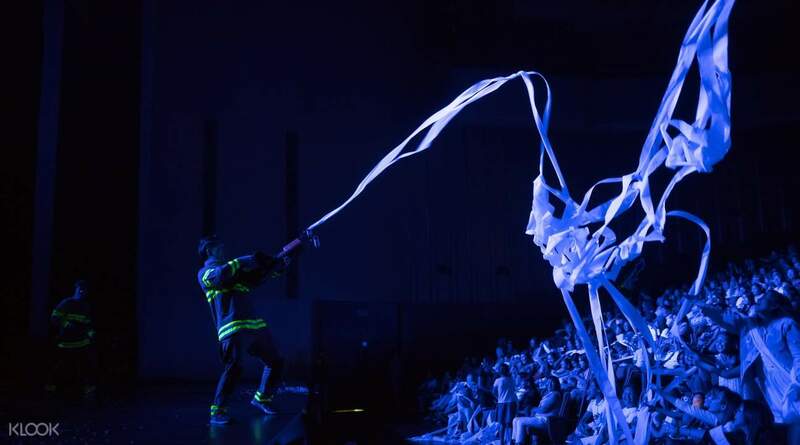 Free Gift: Catch the show from 1 May-30 Jun 2019 and get a free pair of Fireman socks! The show was great... we really enjoyed and highly recommended it. 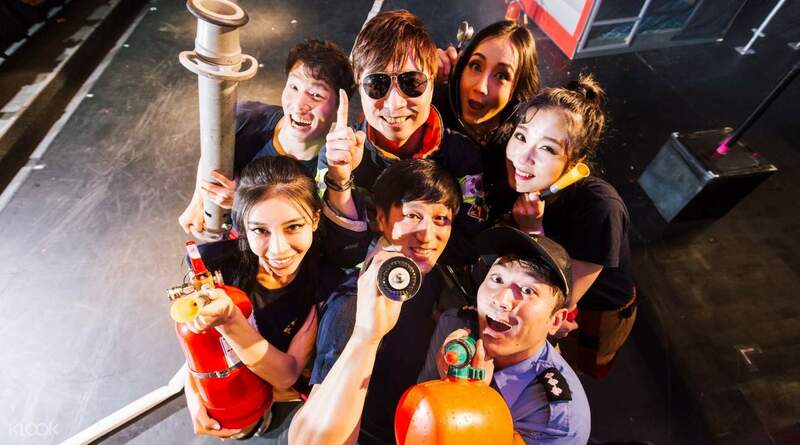 The Fireman Show is the latest show in Seoul showcasing the strength, tough training and dedicated work of a fireman! There's no need to know any Korean because this non-verbal performance transcends all languages. Follow the story of a group of trainees who struggle to get through their strenuous and high intensity training in order to become skillful firemen. Watch in awe as the performers dance, do parkour, acrobatic lifts, flips and other intricate moves. Marvel at the stage lighting and effects while enjoying this unique and funny show. By the end of the show you will have a new perspective of the fun and excitement involved in a fireman trainee's day to day life on the field. 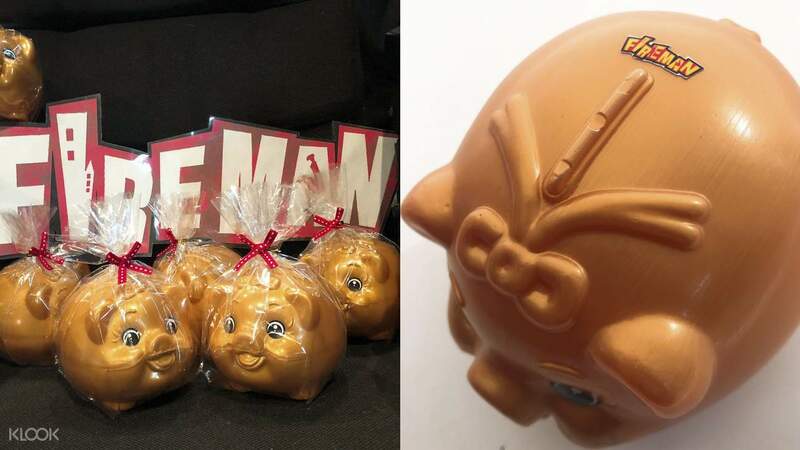 Take home a free gold piggy bank when you book an R seat! Very smooth arrangement. The venue was easy to locate. Got tickets redeemed at counter quite easily. We’re arranged on the 7th row, which was the last row of r-seats. There weren’t many audience the day we went there, so I wouldn’t say our seats are the best value-for-money choice. I would choose s-seats next time. The show was good and the atmosphere was warm. We had the chance to take photos with the crew after the show. The gift piggy banks were lovely. All in all, content!! Very smooth arrangement. The venue was easy to locate. Got tickets redeemed at counter quite easily. We’re arranged on the 7th row, which was the last row of r-seats. There weren’t many audience the day we went there, so I wouldn’t say our seats are the best value-for-money choice. I would choose s-seats next time. The show was good and the atmosphere was warm. We had the chance to take photos with the crew after the show. The gift piggy banks were lovely. All in all, content!! Really recommend that it is the Show you must try in Seoul. Easy to change the ticket by KLOOK, just go downstairs one hour before the Show. No worry about language, easy understand overall. Very possible that will see again if in Seoul again. Really recommend that it is the Show you must try in Seoul. Easy to change the ticket by KLOOK, just go downstairs one hour before the Show. No worry about language, easy understand overall. Very possible that will see again if in Seoul again. It’s fun and a show full of laughter. Both adults and kids enjoyed the show. My boys who are 7 and 4 laughed throughout the whole show. They actresses and actors danced so well. It’s worth the money! We recommend it to all people. It’s fun and a show full of laughter. Both adults and kids enjoyed the show. My boys who are 7 and 4 laughed throughout the whole show. They actresses and actors danced so well. It’s worth the money! We recommend it to all people. the place is not that difficult to locate, same building with another show. when you reached, just show the voucher on your app to exchange for the tickets. was given a second row seats, perfect views. the show is funny and interesting. good interaction with the casts. worth the visit. the place is not that difficult to locate, same building with another show. when you reached, just show the voucher on your app to exchange for the tickets. was given a second row seats, perfect views. the show is funny and interesting. good interaction with the casts. worth the visit. really very funny and fantastic show, all the actors are very professional in acting. very recommend to watch it and worth of price. and would bring my family to watch this show again next time when come to Seoul. really very funny and fantastic show, all the actors are very professional in acting. very recommend to watch it and worth of price. and would bring my family to watch this show again next time when come to Seoul. A great activity to spend a night in Seoul. The show is completely designed for tourists. Don’t need to know any Korean can still understand the show completely. All fire fighters(performers) were so energetic, charming, pretty & handsome. A very enjoyable evening. A great activity to spend a night in Seoul. The show is completely designed for tourists. Don’t need to know any Korean can still understand the show completely. All fire fighters(performers) were so energetic, charming, pretty & handsome. A very enjoyable evening. We enjoyed the show. It was an entertaining one. The characters are different from one to another. They include the audience by inviting one of the the audiences to join in with them together in the show. They even allow us to take pictures together with the actors and actresses after the show. They also have a photo booth there with the fireman outfit for us to wear and pose. We enjoyed the show. It was an entertaining one. The characters are different from one to another. They include the audience by inviting one of the the audiences to join in with them together in the show. They even allow us to take pictures together with the actors and actresses after the show. They also have a photo booth there with the fireman outfit for us to wear and pose. This is a good time, our family is very happy, this is an unforgettable time, if you are traveling, I recommend you to come over, very recommended itinerary, worthy of inclusion in your list.so good and cheap. This is a good time, our family is very happy, this is an unforgettable time, if you are traveling, I recommend you to come over, very recommended itinerary, worthy of inclusion in your list.so good and cheap. Watched this for the first time with my family and we all enjoyed it. It is truly different from Nanta and although I personally think Nanta is more entertaining, I'd recommend you to give this a watch too if you haven't. Watched this for the first time with my family and we all enjoyed it. It is truly different from Nanta and although I personally think Nanta is more entertaining, I'd recommend you to give this a watch too if you haven't.